September 3, 2009: The sun is in the pits of the deepest solar minimum in nearly a century. Weeks and sometimes whole months go by without even a single tiny sunspot. The quiet has dragged out for more than two years, prompting some observers to wonder, are sunspots disappearing? "Personally, I'm betting that sunspots are coming back," says researcher Matt Penn of the National Solar Observatory (NSO) in Tucson, Arizona. But, he allows, "there is some evidence that they won't." "Sunspot magnetic fields are dropping by about 50 gauss per year," says Penn. "If we extrapolate this trend into the future, sunspots could completely vanish around the year 2015." This disappearing act is possible because sunspots are made of magnetism. The "firmament" of a sunspot is not matter but rather a strong magnetic field that appears dark because it blocks the upflow of heat from the sun's interior. If Earth lost its magnetic field, the solid planet would remain intact, but if a sunspot loses its magnetism, it ceases to exist. "According to our measurements, sunspots seem to form only if the magnetic field is stronger than about 1500 gauss," says Livingston. "If the current trend continues, we'll hit that threshold in the near future, and solar magnetic fields would become too weak to form sunspots." "This work has caused a sensation in the field of solar physics," comments NASA sunspot expert David Hathaway, who is not directly involved in the research. "It's controversial stuff." The controversy is not about the data. "We know Livingston and Penn are excellent observers," says Hathaway. "The trend that they have discovered appears to be real." The part colleagues have trouble believing is the extrapolation. Hathaway notes that most of their data were taken after the maximum of Solar Cycle 23 (2000-2002) when sunspot activity naturally began to decline. 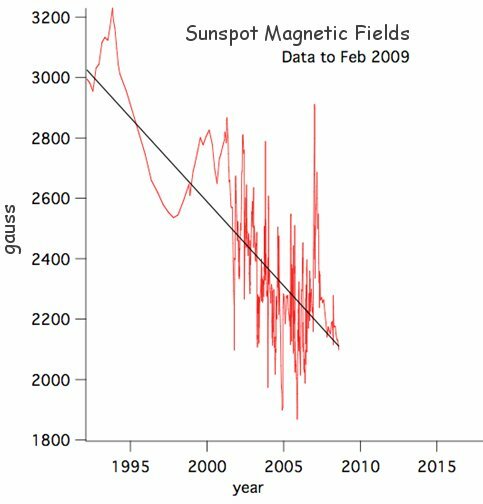 "The drop in magnetic fields could be a normal aspect of the solar cycle and not a sign that sunspots are permanently vanishing." Penn himself wonders about these points. "Our technique is relatively new and the data stretches back in time only 17 years. We could be observing a temporary downturn that will reverse itself." The technique they're using was pioneered by Livingston at the McMath-Pierce solar telescope near Tucson. He looks at a spectral line emitted by iron atoms in the sun's atmosphere. Sunspot magnetic fields cause the line to split in two—an effect called "Zeeman splitting" after Dutch physicist Pieter Zeeman who discovered the phenomenon in the 19th century. The size of the split reveals the intensity of the magnetism. 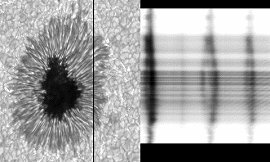 Astronomers have been measuring sunspot magnetic fields in this general way for nearly a century, but Livingston added a twist. While most researchers measure the splitting of spectral lines in the visible part of the sun's spectrum, Livingston decided to try an infra-red spectral line. Infrared lines are much more sensitive to the Zeeman effect and provide more accurate answers. Also, he dedicated himself to measuring a large number of sunspots—more than 900 between 1998 and 2005 alone. The combination of accuracy and numbers revealed the downturn. If sunspots do go away, it wouldn't be the first time. In the 17th century, the sun plunged into a 70-year period of spotlessness known as the Maunder Minimum that still baffles scientists. The sunspot drought began in 1645 and lasted until 1715; during that time, some of the best astronomers in history (e.g., Cassini) monitored the sun and failed to count more than a few dozen sunspots per year, compared to the usual thousands. "Whether [the current downturn] is an omen of long-term sunspot decline, analogous to the Maunder Minimum, remains to be seen," Livingston and Penn caution in a recent issue of EOS. "Other indications of solar activity suggest that sunspots must return in earnest within the next year." Whatever happens, notes Hathaway, "the sun is behaving in an interesting way and I believe we're about to learn something new."